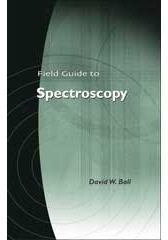 Of all the Field Guides published to date, this one may stand out due to its relatively broad topic: the field of spectroscopy. Indeed, entire field guides can be written on what is covered here in one or two pages (witness the two pages on polarization here versus an entire Field Guide devoted to that topic published previously). Whatever limitations this may impart on this volume, I accept them and expect that the reader will understand them, too. This material is derived from several sources, including my own training in infrared and circular dichroism spectroscopy from Rice University and the Lawrence Berkeley Laboratory; from courses I have taught in spectroscopy at Cleveland State University; and from personal research I conducted in the course of authoring "The Baseline" column in Spectroscopy magazine since 1994. Writing is a form of self-education, and I have been blessed with fast (though not always accurate) typing skills with which I can benefit by increased writing and, as a result, learning. Thanks go to my colleague, John F. Turner II, for his review of the initial Table of Contents. I would also like to thank reviewers Brad Stone of San Diego State University and Vidi Saptari of MKS Instruments, Inc., for their thoughtful comments on the manuscript, and John E. Greivencamp of the University of Arizona, series editor, for leadership in the Field Guides series. This Field Guide is dedicated to my family: my wife, Gail, and my sons, Stuart and Casey.